Size of Male: 40-55 lbs., 18 in. Size of Female: 40-55 lbs., 17 in. The medium-sized Field Spaniel is considered docile and fun-loving. They are one of the rarest of all the spaniel breeds but they make great family pets. They adore their families and love children. They want to be close to their owners at all times. These dogs are known for being very steady. Fun-loving but sensitive, this dog breed is intelligent and easy to train. The Field Spaniel originated in England in the mid-1800s. These original dogs, bred by Phineas Bullock in England, had tremendous body length, were low to the ground, and had great bone. The breed has been improved since that time to be less exaggerated. Crosses were made with Springer Spaniels and Cocker Spaniels. The breed was introduced into the United States in the 1880s and remained a type of Cocker Spaniel until the 20th century. It was finally decided that any of these crosses over 25 pounds would be called a Field Spaniel. Since then they have developed their own unique breed type. The Field Spaniel is a sweet, playful dog which makes an excellent family pet. They are very devoted and loyal to their owners. They prefer to be close to their families. They can be somewhat wary of strangers but will quickly warm up to them when introduced. These dogs will make good watchdogs since they will give an alert when strangers approach and they are known for having a “level-headed” personality. They don’t get too excited or have displays of temperament. These dogs are sensitive and intelligent and do well with any kind of dog training. They can also be independent at times. Although they usually get along very well with other dogs and cats, you should be careful about other small pets. They will need to be socialized with any other pets because of their hunting instincts. Birds in the house may present a problem unless you socialize your dog with them as a puppy. Living Environment – This dog breed can adapt to living in an apartment if you are diligent about providing your dog with plenty of exercise. They prefer to have a fenced yard of their own. They are fairly adaptable dogs so they can live in different situations. However, they do not make good kennel dogs because they always want to be near people. This is true of all spaniels. Grooming – Grooming for this dog breed is not difficult. They have a shorter coat than most of the spaniel breeds. They should be brushed out about once a week and bathed as necessary. They do need to be trimmed to stay looking tidy every few weeks. Keep their ear canals clear of hair and clean their ears regularly to avoid ear infections. You should also scissor their paws to keep them from tracking mud in the house. Diet & Exercise – Dietary needs for this dog breed is normal. These dogs do require plenty of daily exercise to stay physically and mentally fit. Otherwise they can become destructive in the home. They enjoy running off-leash but you should only allow them to run off-leash in a safe area. They can be inclined to chase things and they don’t always return when called. Health – In the health department, this breed can be prone to canine hip dysplasia and ear problems. If you are interested in this breed you should talk to a breeder about possible dog health problems. 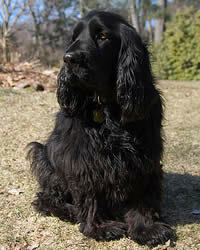 The Field Spaniel is a very docile, loving breed and they have a strong desire to please their owners. They typically do well with dog training, particularly if it’s begun early, when the dog is a puppy. ince they are somewhat sensitive, they do best with positive dog training methods (praise, rewards). This breed should also be well-socialized from a young age to overcome wariness towards strangers.